Every project you create with the Harmony solution starts with an environment; it is the highest level in Control Center. You can build a complete environment by adding jobs, scenes, elements and drawings. • Environment: This is the name of your animation project. • Jobs: These are the major sections of an environment, such as sequences or episodes. IMPORTANT: All jobs are stored in the same location in the Harmony database. Be sure to prefix all job names appropriately, so you can identify the project it belongs to. Each job must have a different name. You cannot give two jobs the same name. • Scene: These are the different shots in a job. Scenes are contained in their respective job folder in the Harmony database. Prefix all scenes names appropriately, so you can identify which environment and job they belong to. 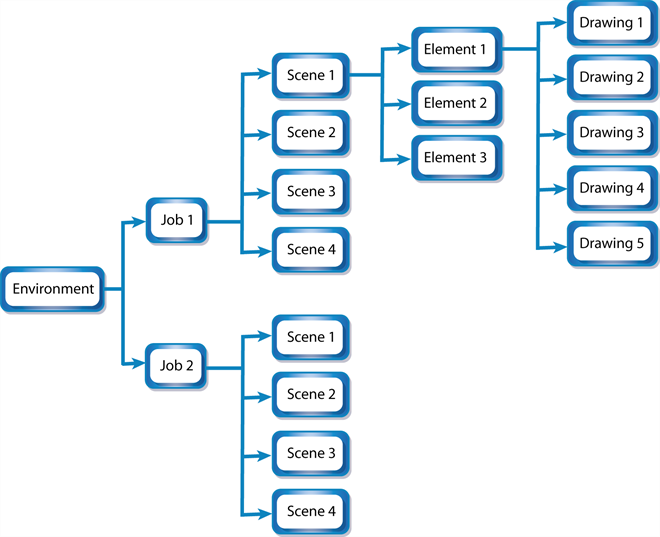 • Elements: These are the different layers and columns in your scenes. If you have not created an exposure sheet yet, the Frames column in the Scenes list displays 0 and no elements appear in the Elements or Drawings list. • A background called bg. • A character called tony. • A highlight effect called hl. You would then find these elements under job 002 and the show_episode_6 scene. The Elements list would display the element names, types of elements in a scene, the type of scans, and the size of the field chart. • Drawings: These are actual drawings of the elements (layers) in your scene. For example, the tony element in 002 of show_episode_6 could consist of 35 drawings. To find these drawings, you would look under Drawings to see the keyframes, state, and stage of each drawing. As your projects come and go, you will probably want to start cleaning up your database, as well as your server's hard disk, by removing old and obsolete environments and their associated animation data. IMPORTANT: After you delete a scene, job, or environment, the associated data is permanently removed from your storage disks. Make sure you really want to erase these items before you delete them as there is no way to retrieve the data after it has been erased. You might want to export old environments and archive them somewhere else before you delete them from your system. If you are working in a mixed Windows/Mac OS X/Linux environment or share files with other studios that do, you should use lowercase letters to name the various items in your animation projects and not include any spaces in component name. For example, write the_show instead of The Show. This recommendation is due to the fact that Linux is case-sensitive while Windows is not.